Some sports page readers complain that Nick Saban has Bama beat writers intimidated to the point of compliance, but I’m wondering if more than a few Auburn fans wish that Auburn beat writers had the same approach. Take the recent obsession with Evan Woodbery as an example. The claim is that Evan, a Bama alum, has been using his position as the Auburn beat writer for the Mobile Press-Register (and, via al.com, the Birmingham News and Huntsville Times as well) to advance a pro-Bama agenda. The centerpiece was a post on the Never to Yield Foundation calling for him to be replaced. The writer of the post, by remaining anonymous, subjected Woodbery to treatment that the writer himself/herself was not willing to face. But I will leave that for fans of irony. I talked to Woodbery about this recently. He said that the morning the post appeared, his email box was full — some hostile, some concerned, some supportive. More than the usual day’s mail (which he says he always replies to). Perhaps the post’s most curious and serious accusation was that Woodbery alerted the NCAA to violations related to the “Big Cat” recruiting weekend the summer of 2009, resulting in minor sanctions against the football program. As he pointed out, Auburn turned itself in and the NCAA did not investigate but accepted Auburn’s self-imposed penalties. Regardless, Woodbery taking such an active role in a story would have violated just about every ethical principle of journalism and I am certain he would have been fired. That he was forced to point all these things out in a response to the NtY post is also a shame. But such is the world we live in today. And that is what troubles me about this situation, including the post. It’s not the tactics that NtY uses, deficient though they may be. It’s the philosophy that powers the tactics. Whether in politics or in college football, readers don’t want information; they want reinforcement. They are interested in only a few aisles in the marketplace of ideas. They don’t want information that challenges their biases; they reject such information as inaccurate and the reporter as incompetent. And if an independent press sees its mission differently, they will go elsewhere, to media that pander to their biases. Translated to sports, it can get even crazier in its own way. As Woodbery noted, college football in particular produces a passion that is unmatched by other sports. Would an Atlanta Falcons fan complain because a Falcons beat reporter grew up in Charlotte or D.C.? The rise of fan-related pay sports sites, such as AuburnSports.com (Rivals), Inside the Auburn Tigers (Scout/Fox), and AuburnUndercover has also changed the game. These sites, many staffed by former sports page veterans such as Phillip Marshall, do a great job of reporting on recruiting and other team developments. But relying on direct financial fan support, they take a slightly different approach than do the beat reporters from the daily newspapers. But whether in sports or politics, it’s sad to see the direction things are going. In both cases, an independent press serves an important function — to make sure the game is fair for the participants, whether it takes place on the field or in legislative chambers. And if the audience seeks only the information that confirms its preconceived beliefs, and ignores the rest, the likelihood for misconduct is greater, because those in power know that they are not being watched as closely. It’s even more ridiculous when the facts don’t come close to matching the accusations. 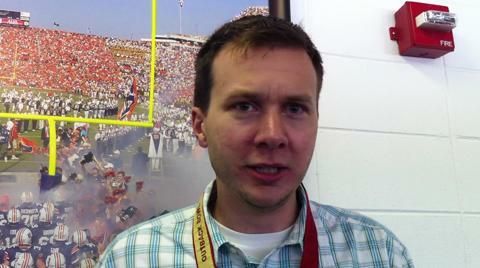 Many claim that the Press-Register holds an anti-Auburn bias and endorses Woodbery’s behavior. But Managing Editor Dewey English was a classmate of mine at Auburn in the late 1970s and is part of strong, respected leadership at the helm. And for all that the Birmingham News is supposed to be a Bammer stronghold, the current publisher, Pam Siddall, earned the enmity of Bama fans when her Twitter account at the time of her appointment included the confession that she was an Auburn fan. On the sports page, many claim that the University of Alabama (i.e., Nick Saban) would never tolerate an Auburn grad covering its teams. But I can think of three different situations where an Auburn grad does just that. One of them, Rachel Baribeau (FoxSports), is no secret. As for the other two, for the time being I will spare them the possibility of the shabby treatment being doled out on Woodbery. So will the enraged masses get their wish? Will Evan Woodbery trade in one crazy, passionate group of fans for another? He told me he has no current plans, though anything can change. I would hope that Woodbery, and any journalist, would never make a lateral move for that reason, because it would encourage such an attitude. One group that endorses Woodber’s professionalism and ethics is his fellow journalists, both on and off the sports page. I have chatted with them, and I have read their comments on message boards. In their minds, his reporting is as solid as his professional ethics. A final note: One such colleague reported writing such a defense of Woodbery and submitting it as a comment to the NtY page. About a week later, it has not appeared yet. That is fine; that is their business. Thank goodness for newspapers that have the integrity to give space to their critics. It’s not a matter of dishing it out vs. taking it. It goes to a much deeper mission that means a lot more to journalism’s practitioners than readers realize. LOL, there are far more biased reporters out there than poor old Evan Woodbery. On BOTH sides, I might add. I’ve always wondered though, how do journalists rectify there supposed “ethics” on reporting when the obvious goal of any newspaper (besides report the news) is to make money? Every sports editor in the state knows they can drive up readership (or page views!) by publishing a “tinted” article about Auburn or Alabama that riles up the opposing fan base. And they do it frequently – the sad thing is fans fall for it almost everytime. Paul Finebaum is the master of this. Good article. I have no qualms with Evan. This article touches on an important point. I believe that the smaller, local media outlets are increasingly struggling with how to stay relevant in the digital age in the face of strong competition, but the principles of economics remain the same. You need eyeballs to drive revenue to keep the doors open. This, I believe, is leading us to a distasteful state of journalism. The message boards on al.com are full of trash. The “Sound Off” column is nothing more than a constant barrage of low-brow childish name calling. I have seen the level of vitriol steadily increasing and that nonsense has fanned the flames of a situation that ultimately produced someone named Harvey Updyke. So, yes, we should all first believe that Evan has journalistic integrity and professionalism. At the same time, I think sites like al.com are reaping what they’ve sewn (and unfortunately Evan is caught in the middle). They could put the brakes on the runaway train a little more than they do, but that doesn’t help with on-line readership now does it? It’s because of the trash that I’ve basically given up on the site. And I feel a lot better as a person for it. Sounds like you’re a good freind of Evan and he’s takign some heat. The heat is deserved. The days of being a hard nosed beat writer are over. All the Bama beat writers stay away from the negative and their fans support them, which is good for their job. Goldberg reports the facts, but is respectful and thus he’s respected. Evan has stepped a little over the line in the past and deserves the negative feedback he’s getting. He should take the path of the guys like Kausler and Hurt do with Saban, but he has too much Bama in him. So what you’re saying, Jim, is that Kausler and Hurt are doing a poor, even biased job of balanced reporting on their beats, and that Woodbery deserves to have anonymous morons call for firing because he’s NOT following their lead? Makes perfect sense. Didn’t realize that NtY was anonymous. Interesting perspective. Still, its now a strange position for the guy and the newspaper, business wise. Probably not but a Eagles fan would damn sure complain about a beat writer who grew up going to Giants games. The same would be the case in Baltimore with a Pittsburgh beat writer. You get the picture. How hard could it be to find a AU beat writer that went to school anywhere other than Bama? Its not like you would need Bob Woodward to keep up with Woodbery’s standards. You should really know who you are talking about before spouting off. John is not some “good friend trying to deflect heat.” He is, in fact, a well published and respected professor of Journalism at Auburn and loves AU to the core. He wouldn’t say this because he is not a braggadocios man, but I think its important you know. What he is pointing out is that that fans tend to look at everything through either orange and blue or crimson and white glasses. To those people, if an article isn’t stroking their school’s ego or reputation, then obviously that reporter has an agenda. In fact, it’s quite the opposite. Reporters are there to hold publicly held interests accountable for their actions. Yes, sometimes stories are broken that don’t shed a positive light on Auburn. That’s life and a good reporter should ALWAYS be skeptical of anything he or she sees. If you aren’t at least questioning, you are doing yourself and your readers a disservice. And if that doesn’t convince you, think of it like this. How would you like it if Evan came to your job everyday and told you how bad you are at it, even though he’s never met you or has any clue on how to do your job in a professional manner? Dr. C, well written article and very insightful. Carvalho also exaggerates Rachel Baribeau’s coverage of Alabama. Per the link he provided, while at the Tuscaloosa News, she was only a multimedia producer, and not a full-fledged reporter. Even though Carvalho knows the distinction, he ignores it because otherwise it would undermine his support of Woodberry. Mr. Carvalho also criticizes the NTY foundation for not disclosing their name. First, the practice of unsigned editorials is typical of most newspapers. Second, speaking of unnamed people, who are all of these fellow journalists that he supposedly spoke to that defended Woodberry’s ethics? I’m sure Carvalho misses the irony re his failure to name people. A key part of Carvalho’s claim re the lack of bias is the fact that he can name one Auburn graduate at each of two Bama-favoring newspapers. While congratulations to them for reaching such a position, I doubt they made it that far by rocking the boat and writing unfavorable articles about Alabama. Moreover, John, why don’t you ask them what their priority is, favorable coverage of Auburn, or generating sales and page views? I anxiously await their response. Finally, Carvalho suggests that “conceivably” Bama fans could find favorable articles written by Woodberry about Auburn. Needless to say, unlike the NTY foundation which actually referenced specific articles by Woodberry, Carvalho leaves his assertion unsupported. Wouldn’t want to work too hard, would we, John? Yes, we are Auburn and we take the high road. We’ll just let Woodberry’s backhanded compliments slide. No big deal. Why don’t we write an article about how AU supports the Occupy movement? I worked with Evan at The Anniston Star for a year or so. I believe it was his first or second job out of college and his beat was covering high school sports. Total professional all the way. I don’t remember EVER seeing Evan even wearing the first thing crimson or talking about the football program at Alabama (granted there really wasn’t much to talk about in those days anyway, heh heh). It pained me quite a bit to see NtY make fools of themselves over Evan. Thank you so much, John, for writing this. War Eagle! No offense to Evan whatsoever, and I would say this regardless of who held his position, but I would rather the AU beat writer not be a UA grad. Call that opinion narrow minded, ignorant, or whatever, but that is just how I feel. Thank you for the well written and thoughtful article. I do not understand this wholesale movement of people, whether in politics or sports, to only listen to those that agree with their opinion. You see it on the various blogs, present company excluded, and message boards. If you don’t tote the party line, you are a blasphemer that doesn’t love (insert your university here) and don’t deserve to wear the school colors. So Evan has written some articles about Auburn that aren’t flattering? Does that mean he is part of some devious plot to bring down the University? Is he some sort of Manchurian Candidate that was brain washed in the bowels of Byrant-Denny Stadium to destroy Auburn? No, of course not. He’s a journalist that reports on Auburn University…the good, the bad and the ugly….and that is the way a free press is supposed to work. Bama fans bash Izzy Gould, the former UA beat writer for the Bham News, for being from Florida (his last gig was somewhere in FL, and he’s moving back to Miami to cover the Dolphins). But their biggest problem was that Gould wasn’t a fan. I get that “fan-journalists” can be the guys at Auburn Undercover or Bama Online. There’s a place for that sort of thing. But for the folks who report facts, and aren’t columnists or basic mouthpieces for the universities, I don’t care where they went to school. Find me a guy or gal who can write, isn’t afraid to ask a tough question, and is interested in the sport over anything else. Ask yourself this: if Woodberry doesn’t report the Tiger Walk, maybe Auburn Compliance never self-reports. And a kid goes elsewhere and starts talking about it. The hammer falls much harder when it’s not self reported. Keep the schools honest, IMO, and we’re all better off. I never had a problem with Woodberry, but I do not have a problem with people questioning his motivations either. In my opinion people on both sides of this are being too dramatic. Regardless of your stance, I think we can all agree that we do not want a Saban style relationship with the media. This is one area in which I have always admired Coach Chizik. I think it is clear that both coaches are skeptical, even fearful, of the media. Both coaches want to control all information regarding thier teams.. The difference is that Saban is a d*** about it. He refuses to answer basic questions, yells at reporters, and intimidates the press corps. Coach Chizik gives just as little information, but he does it with a smile, a bunch of worn out cliches, and sometimes a boring story (if your lucky). Just to clarify, I was a internet anchor responsible for covering the Alabama football beat. I was responsible feature pieces, sit-down interviews, packages, covering ALL press conferences, practices, games, the national championship, etc. While with Fox/Scout.com, I covered the SEC West in football and recruiting. Wes – your opinion is narrow minded and ignorant. Or whatever. You’re welcome. A journalist should be impartial. End of story. Unfortunately this is an ideal which can only be aspired to and never achieved, because, as humans, we will always harbor opinions on matters. The good journalists keep their opinions out of their reporting (unless asked to provide an editorial or opinion column). I’ve had my issues with Mr. Woodbery’s reporting in the past, and I have to admit that I’m not a fan of an Alabama grad being that close to Auburn on the surface, but impartiality is a core concept that is getting left behind in search of pageviews and subscriptions. Having Evan Woodbury on Auburn’s beat might mean that things are a little more balanced than in West Alabama. Personally, I’d rather the culture around Auburn be as different from the one around Alabama as possible. I’d rather lose our way than win theirs. What this article, and apparently a majority of the posters here, fail to realize is that “Impartiality” is exactly what NtYF was calling for. NOT a bias AGAINST the school they are hired to cover. Impartiality would be great compared to what Evan has been presenting now. Additionally, no one ever attacked Evan or suggested he be fired. The article in question suggests he move to the newly vacated Bama Beat for the same paper. Why overreact to a lateral move to cover his alma mater, which to him should be considered an upward move? How is that more sacred than getting someone who is capable of reporting without a bias against the team he’s covering? What if a reporter covering the Boston Celtics grew up a 76ers fan, who hated the Celtics to his core? Do you think the passionate Celtics fans would put up with that? Well, it seems like they have, and they still do with one of the legendary sportswriters of all time, Bob Ryan. And he’s not the only example of this. There are Auburn grads covering Georgia and Alabama sports. There are Georgia grads covering Georgia Tech. There are Missouri grads covering Kansas. That’s what happens when people are educated in a certain region. They get jobs in that region. If you don’t like how Woodberry covers Auburn, go on your way and find another beat writer who is more your style. There are plenty of them out there. What a ridiculous attack on a foundation sticking up for Auburn in the press. I am disappointed in you TWER. John’s article is the very type of subjective opinion piece that he is attacking. Its sports journalism for goodness sake. People don’t want an edgy opinion piece, I just want the facts. So Rachel, ssince you’re monitoring this discussion, would you address the claims of several AU fans that despite attending Auburn, you’re at heart a Bama fan? Could you explain why, despite covering all of the SEC West now, all of the football pictures of you on your blog are Bama related? If you’re truly a Bama fan, Carvalho’s point is still misplaced. Many good points have been made on all sides and vice versa. What do you guys think of the Boston College coaching situation that happened a few years ago? I had a huge problem with Woodbammer’s coverage of the Winston situation. He had every opportunity to clarify the situation with the AU coaches and he chose not to and got it wrong. He didn’t just get it wrong – he ran 100 miles an hour in the wrong direction – hurting AU in the process. He is either biased against AU or he is incompetent. Period. The original post seems to be arguing it is the latter. As far as the post in general…bama gets the positive coverage, the spin, the good PR, the cover-ups by the media, and nobody steps up and calls them on it. AU finally gets its “Fox News” and other AU people step up to criticize it for sounding off?!?!? Sometimes we just can’t seem to get out of our own way. Outstanding article. Three cheers for striving for objectivity. Thanks for the counterpoint. AUChizad — Impartiality is not what the anonymous Never to Yield post calls for. What it calls for, explicitly and implicitly, is for Woodberry and other beat reporters to shy away from what could be perceived as “negative” stories. The anonymous author brings up specific examples that he evidently would rather never have been written, like blog updates of recruiting targets signing elsewhere, and an article about a compliance clause in Tony Barbee’s newly-signed contract — all of which was timely and newsworthy at publication. What that author, and what some in this very comment section are calling for is biased, “pro-Auburn” reporting, which isn’t even “reporting” at all. What Dr. Carvalho wants has nothing to do with some kind of “moral high road” or any kind of “us vs. them” dichotomy, but simply that reporters are balanced in their work, so that an audience and a readership that is looking for Auburn news can actually get Auburn news. And what Dr. Carvalho is calling for in this piece is that anonymous Internet posts stop bashing fair reporters until there’s none of them left, because then those readers will be without true Auburn news — the good and the bad. At the end of it all, no one can say that Evan Woodbery isn’t a tough, inquiring reporter, because he is. And no one can say that he isn’t a very good writer, because he is. In all of this, I found the most poignant response here to be from AirCooledTiger. If Woodbery wants to know where some of this biased, “us vs. them” atmosphere is coming from, he just needs to look at the name cutting his checks. It’s promoted on the same website as his articles, right there on the same page, underneath and around his writing. This article is a plea to diffuse that atmosphere, and it’s a very good one. Very well said, Dr. Carvalho. You read the article with a tone assuming the worst and read things that weren’t there, obviously. Where do you find anything in that article that supports your claims? “Auburn fans aren’t asking for a sunshine pumper or someone who contributes nothing but fluff pieces glorifying the program or its players. Explicitly stating the opposite of what you claim. One could cherry pick hundreds of articles that display a perceived “negative” bias, which is not what that article did. It pointed out that Evan reported Auburn for secondary violations, and was proud of this. The article then made the point that you and the author of this post obviously missed. The Jaboo Winston coverage they mentioned was particularly egregious because he was dead wrong in his accusations. He tried to pull another “big scoop” to tattle on Auburn, but he was completely wrong on his facts. Finally, the Tony Barbee contract story you mentioned. As the article points out, Brian Van Gorder was just hired at Auburn, and instead of informing his customers about that, he writes that garbage trying to insinuate that cheating at Auburn is so rampant they have to include a clause explicitly mentioning it for both the football and basketball head coaches? What informative purpose did that article serve? As “TheTruth” alluded to, we are our own worst enemy. Someone stands up for Auburn’s mistreatment in the media and we eat our own. Meanwhile Paul Finebaum scoffs and snorts about the whackjobs at NtYF in the same breath that he credits IBleedCrimsonRed.com as a bastion of journalistic integrity, which that site actually tries to masquerade as. They even published his response on their site in the interest of fairness, which the author of this post linked to. Which again, they had no obligation to do. Would IBleedCrimsonRed do that? The article didn’t call for his firing. It called for his transfer since the door was open for him to take the Bama beat job. Hey, why don’t they just hire an Auburn grad to fill Izzy’s position? I’m sure no Bama fans would have a problem with that whatsoever, would they? And if any trouble-makin blog tried to bring it up, I’m sure a legion of Bama fans would all attack that blog as a bunch of cowardly lunatics. I copied & pasted a paragraph in the wrong place. Since I can’t delete or edit, I’ll clarify here. “It may have been editorial discretion on the part of the newspaper to hand Woodbery every negative story of the day. It could have been luck of the draw. When it comes to comparing our beat writers to how the bama ones act, it’s like I always tell my kids: if you see another kid doing something wrong, and it seems to be paying off for that bad kid, then it is OK for you to do that wrong thing too. Otherwise, it’s just not fair. Not a parent. But yet this appears to be awful advice if it’s in any way serious. So you’re calling me a bad parent now? How dare you judge me anonymously on the internet! My kids are the coolest kids in class, so I’m doing something right. AUChizad — If you were to read Woodbery’s response to the anonymous post’s accusations, he clarifies that on signing day, his fellow AL.com writer Charles Goldberg had canned blog updates for each Auburn target in case they signed with Auburn. It was Goldberg’s job to tweak and post his updates if they signed, Woodbery’s to provide the news when they didn’t. It wasn’t by any kind of choice or “luck of the draw” — it was by design. And I find it unfathomable that anyone could be up in arms about him giving updates about targets that Auburn missed on. If the posts just never existed, which you say you would prefer, you would have spent all signing day trying to figure out what happened with Kwon Alexander, wondering if he signed with Auburn or if he didn’t, and why there wasn’t an update on him. The same is true with the Barbee piece. (All of these are incredibly weak examples of any kind of bias, by the way.) All those AL.com writers are published in all three of those papers. How many articles from the Van Gorder presser do you want, with the same quotes and the same background information, in the same sports section? Maybe I’m crazy, and maybe I’m the only supporter of Auburn basketball in the world, but the compliance clause in Tony Barbee’s contract has been a huge deal ever since he signed (or DIDN’T sign) with Auburn, as he had been working under a verbal agreement for two years while they worked it out. I remember that article — I’m glad I learned the details. The comparison was made to the policies in Chizik’s contract because that’s what Barbee demanded. And maybe I’m the only one not trying to engage in some kind of bunk Barners vs. Bammers “who-looks-better-on-AL.com-today” comparison, but if Auburn misses on a recruit, I’d like to hear about it. It’s news. Justin, you still fail to the point the article was trying to make. Of course they should report that these players signed elsewhere. I doubt from the context of their article that the NtYF disagrees with this. They merely pointed out that Woodberry *O-N-L-Y* reporting on the misses, perpetuates the PERCEPTION of bias. The fact that he was the one who “by design” was assigned to only report on the misses, coupled with the fact that he is an Alabama graduate, along with the other instances mentioned in that article, is enough to perceive a negative bias. If that was his only offense, as the article points out, it would have gone unnoticed. You are fixated on one example, that the article itself said “in fairness” that exactly what you are saying was probably the case. It goes on to say what you choose to ignore, which is that with the perception already there due to other factors, his alma mater not the least of which, that it feeds the perception of bias against Auburn by our own beat writer. Bama fans boycotting the Birmingham News due to a percieved “Auburn bias” (which is beyond absurd), thus costing jobs and livelihoods, is trumpeted by Finebaum, etc. as a noble cause. Meanwhile, these guys merely suggest that given the opening at the Bama beat, the MPR has an opportunity to transfer Woodberry to the same job, but a different and more natural fitting team, and people within the Auburn fan base want to attack them for it? Usually I just let everyone comment, but I wanted to jump in with one bit of info that was requested. The unnamed journalist who wrote the post to NtY supporting Woodbery was Christa Turner, who covered Auburn for the Columbus Ledger-Enquirer for several years. I did not identify her because I could not contact her to get her permission to do so. But she has contacted me and told me it was OK.
And for the record, her post has still not been published by the Never to Yield site. I may not be a professor, but I’ve got a doctorate in Street Smarts. I give everyone a low B+. If we can build some consensus by the end of the day, it can be pulled up to a high A-. Once you realize that the NTYF is made up of sick mentally Ill nutjobs, they are easy to ignore. They only make AU fans look like the stepchildren that bama fans say we are. We don’t wear paranoia well. I live in Mobile and have read almost everything Evan has written since he joined the Press Register in 2004. I have found his coverage to be completely professional and objective and have never detected any hint of pro-Bama or anti-Auburn bias. Until I saw this item I had forgotten that he was a Bama alum. John, thank you for finally providing the name of the anonymous source you cited in your attack on NtY. However, I still have a problem with using anecdotal, uncorroborated here-say in an article to justify a weak argument. It undermines your point. I do not believe NtY is calling for what you suggest, they just want an objective journalist to cover Auburn. I have read enough articles written by Evan for me to come to the same conclusion as NtY. tigger – Give it a rest. Obvous bama troll is obvious. “Sick mentally ill nutjobs”. Really. How did you arrive at that conclusion? With professors like this guy teaching journalism at Auburn, it’s no wonder the pool of qualified journalists with an Auburn degree are so limited that an Alabama graduate has to be hired to cover the Auburn beat. So full of fail. I’m with NtYF. There was zero need for this article. So tired of Auburn folks attacking their own when we’ve got a state full of idiots in crimson that will do it for sh*ts and giggles any day of the week. There was a simple solution to this: email the guys at NtYF if you had questions about how they handled it or wondered where a comment ended up. Their article had a valid point and you basically attacked a strawman version of your own making. Oh my god… full of yourself much, “Doctor”? I too have read plenty of Woodberry’s stuff, and I find the accusations pretty silly. I’m sure if people didn’t know he was a bama grad, they wouldn’t think he was so biased. And that’s what it really comes down to: it doesn’t matter what the guy does, people have it in their mind that he is out to get Auburn due to his bama roots, so that’s what they see. You could pick out any of the beat writers and find a negative article that proves they are “biased” against Auburn. Some people need to grow up and spend their time being productive instead of calling for this guy to get fired (or “just” transferred across the state). I had a long post written up here. I had examples, a bit of anger, and a lot of logic in trying to explain all of this. Then I remembered this is Auburn football. Logic need not apply here. But I also see all the discussion, and see the posts on the Never To Yield Foundation’s website. And it makes me sad. Very, very sad. It makes me feel like less and less a part of the Auburn family. Because I don’t know those people, and I don’t think I would want to know them. Something that has always stayed with me is the Auburn Creed. If you ask me what separates Auburn from ANY other school in the nation, it’s the Creed. It’s words are so strong, so full of meaning, and yet so humble, that it’s something I strive for every day. I got a little Auburn Creed card at Camp War Eagle, 2005. I’m hopefully going to be back at Auburn in the fall for graduate school. I still have that card in my wallet. It’s seen two wallets, four tiger cards, three ignited cards, three drivers licenses, and 3 debit cards. “I believe in the human touch, which cultivates sympathy with my fellow men and mutual helpfulness and brings happiness for all. These aren’t just words. This creed is truly what makes an Auburn man or woman. People forget them all the time. And it stings, every time I see a self-declared member of the “Auburn family” not living up to the standards that Auburn people have set for themselves since George Petrie wrote the Creed. It almost seems that the Woodbery post from NtY was interpreted here as an attack on the profession. Pretty good discussion in these comments above. Unfortunately, the latest NtY post is toxic. What a shame. Being an anonymous blog the TWER critique should be sticks and stones for them, but instead, in an attempt to soothe their internet ego, they undermine their own mission. I just thank the Lord that in all my years in the Armed Forces that I didn’t have to work everyday with the bunch of no-back-bone squishes that have been posting in this thread. I guess AU produces both kinds though… men out of the ROTC unit and utter milquetoasts out of the Journalism school. This is the first time I was in total disagreement with John. Woodberry is a poor choice for an Auburn beat writer. As far as journalism goes, it has sunk to new lows these days. When 2/3 of the country believe the press is biased and usually biased towards the left of the center folks, you know its a different day/year for journalism. The NtY foundation doesn’t claim to be anything other than pro Auburn advocates and John’s attack piece on the NtY was both unfair and unwarranted. I am a very disappointed War Eagle Reader. If NtY wanted to foster discussion on the topic, and if this article truly wasn’t needed, then why haven’t they posted any comments that could be construed as negative?